Next in the line of larger salons was the Lamm Industries room in which I finally had an opportunity to hear the ML3 Signature single ended triode monoblocks. At the New York show last spring, one of them arrived in damaged condition, disappointing many. 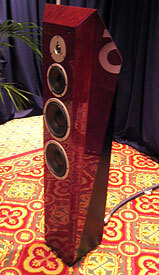 The ML3 has a separate power supply, hence the four units between the Verity Audio Lohengrin II loudspeakers. I heard a jazz LP on a Basis turntable that sounded outstanding. A digital front end, NeoDio NR Two transport and NR Two D/A DAC reportedly cost about $12,000. A Lamm L2 Reference preamplifier and LP2 phono stage handled the low-level signals and Critical Mass Systems racks and Kubala-Sosna Emotion cables completed the set-up. 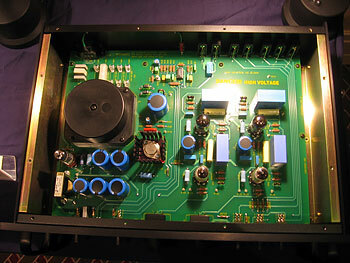 The interior of an LL2 preamplifier that was awarded an Enjoy the Music.com Blue Note Award (in 2001) revealed that Lamm is now using some kind of special fuse (seen just above the transformer) which corroborates my findings with AVM (Blue Tube Goop) when applied to fuses. So, how good is the new ML3 amplifier? In this league, I would need to hear a direct comparison with its predecessor. But what is most important about this demonstration is that you don't need megawatt amplifiers in large rooms if you choose you loudspeaker carefully. The Lohengrin II heard here was certainly in that upper echelon. The ML3 is rated at 32 wpc with its GM-70 tube at 4, 8 or 16 Ohms. The importance is in the quality of the first few watts and with Lamm, that quality is always very, very high. I peeked into the Pioneer Elite room and gazed at the Kura plasma TVs that have received so much attention in the past year. Very nice, but they give evidence that plasma sets may now be increasing in cost, rather than coming down as we approach the end of the analogue TV era. If the rise in the commodities market is any indication, this trend will continue. Linda and I are still holding out, however, with an inkling of even greater things to come from technology developed by Kodak and licensed to Sony. The hall outside the Coup de Foudre room on the second floor was not encumbered with Wilson loudspeakers as it was last year. Then, the room was filled with tables covered with silent product and a jungle full of stand mounted acoustic traps bringing the main rig to a state very near perfection. This year the extra equipment was dispersed to the other excellent sounding presentations on the upper floors. And the forest of acoustic traps had been logged for firewood during the cold winter. What remained were hardly the dregs. Once again, Wilson Watt/Puppies presented the music, supplemented this year with the new passive Watch Dog. A Parasound monoblock powered each Watch Dog while VTL monoblocks powered the Series 8 Watt/Puppies, connected with Transparent Opus MM cables. 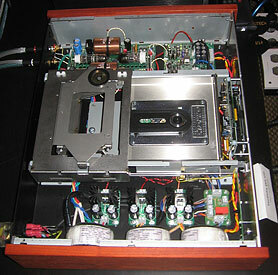 A VTL preamplifier was fed by an Audio Aero Prestige CD/SACD player and a Brinkman Balance turntable. Even without all the tube traps, this room repeated the excellence I heard last year. If my enthusiasm seems lacking, simply return to last year's report. A repeat Best Room, for sure. Moving below ground to Level A, I first encountered the Gamut Audio room. I've sung praises about this gear for many years, and it seems to have turned a corner and reached a higher ground in the past few. The rig here included a Basis Signature turntable, Gamut CD player, DI 150 integrated amplifier, possibly used as a preamplifier, or in a bi-amp set up with a pair of M250 monoblocks, and Transparent cable. I had a very interesting conversation with Lars Goller, chief designer and president, who explained to me Gamut's development of cable input sockets and loudspeaker ports comprised of concentric collars of aluminum and brass to nullify vibrations in these areas in the lower line loudspeakers, while the flagship model shown here uses more expensive stainless steel and brass. This bi-metal approach allows Gamut to tune the loudspeakers to a lower than usual frequency. Lars explained that the horizontal grooves in the side of the cabinet were designed to break up resonances between different compartments within. I noted that the complex metal base was probably also designed with vibration isolation in mind. From a furniture perspective, I admired the natural flat finish of the tall floorstander and Lars apologized for it not being completely finished. The Danish modern approach often includes this more natural look, however. I also liked the horizontal bungee cords of which my colleague Phil Gold wrote. They contribute to that contemporary look and are unique in my experience � something that is necessary in this ultra expensive price league. Phil's photo belies the size of the loudspeaker, however. You need to know that Lars could stand shoulder to shoulder with players in the NBA. The room was dimly lit, but I chose not to use flash in order to render the flat finish correctly. This was another of the Best Rooms at this year's show. 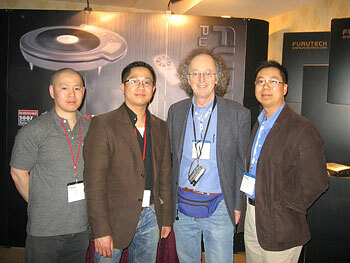 Next door, I found Simaudio components driving a new Monitor Audio PL 300 loudspeaker with a ribbon tweeter. Phil covered this room nicely in his report, and I must concur that they sounded much better than I expected. The front baffle is covered with leather which conceals an additional composite resin for vibration absorption. 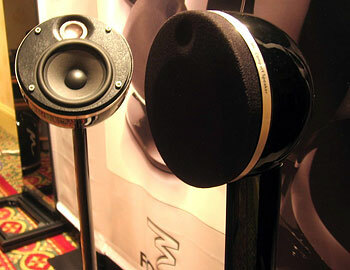 These wide range (28Hz to 100kHz) loudspeakers could be a real sleeper. For their 30th anniversary (1977 to 2007) Dynaudio introduced the Sapphire loudspeaker ($16,500) with an angular combination of burl gloss veneer and satin black finish. The rear ported design allows for single wiring only. They were driven, as usual, with Moon electronics. Distinctive styling was combined with a high quality sound here. Totem Acoustics alternated between a home theater presentation (the white loudspeakers) with the Tribe 3 featuring Vince Bruzzese's very special small mid-woofer, and the 20th anniversary Limited Edition (on stands) of their Model One which has become a classic. At $3600 the Limited Edition is a fair step above the standard issue in cost, but with extra-cost drivers, parts and wire this was easily recognized as an audible step up in quality. For small spaces where minimal, but high quality visual impact is desired, this stand mounted monitor is a prime contender. JM Labs is well known for their outstanding lines of loudspeakers that range from affordable to "If you have to ask....." I almost committed to a home theater presentation, but jumped out of the room just as they closed the door. The round two-way lifestyle monitors called Dome seemed to be the bigger news. They will be available in gloss black or white for now, but six months down the road they will offer five different colored grills for customization. They can be had in either desktop, wall mount, or stand mounted versions. With the quality drivers Focal is known to produce, this could be something special. They are about the size of cantaloupe, and so new they are not yet up on their website. The aluminum balls are slightly smaller than the similar Sib model and offered in stereo pairs ($750), 2.1 system ($1595) or 5.1 surround system ($2500) for those who do not need subterranean bass. While they are decidedly contemporary in style, they are also small enough not to be conspicuous in a more traditional setting. Rounding out Level A, I stuck my body into a small salon and discovered the Gang of Four from Audiyo.com. "Quick, we have to get a picture of the Gang of Four" I cried. "But there are only three of us!" one of them replied. With eyes popped wide open in disbelief I asked, "One of you has died?" "No, one has gone for coffee" he exclaimed. In the photo you will notice a slight generation gap between us. They took me on a tour of their many tables filled with mods and products from many sources, including the AVM (Blue Tube Goop) that I reviewed in my Winter Tweakfest review. I was intending to do a more comprehensive review of this vibration absorbing substance, but my editor nixed the idea, perhaps fearing that widespread use of AVM on existing products might erode sales of new equipment and undermine our advertising base. Who knows? But what excited me on this visit to the Audiyo.com space was the Milty ZeroStat 3 anti-static ion gun for blasting your LPs before playing. They had a static meter and gave me a very convincing "Before & After" demonstration, lowering the reading from 5.9 to 0.29 (kV?). Then they tried to interest me in their low jitter clock modules for CD players from Tentlabs, but that was way above my tweak league. And finally, to totally destroy my ego, they took me to the raised portion of the room where a rig was playing music. 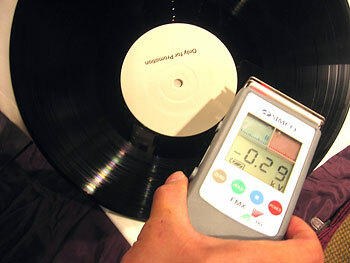 The source was a Tentlabs DIY CD Player, a $4000 kit from Denmark. The Zerostat I might be able to handle, but not this! I descended one level further into the bowels of the Sheraton where I encountered the last of the Best Rooms at the show set up by Globe Marketing and Brinkmann North America. At roughly $200,000 this rig should sound very good and indeed, it did not disappoint. In fact, it was far superior to last year's Avantgarde demonstration where the bass response of the Uno was decidedly muddy. After a brief listen, I left the room, but doubled back to take up Larry Blair of Brinkman on his offer to play some of my own music. The Duo Mezzo loudspeaker with folded horn bass module ($47,250) threw a huge, deep soundscape that made me feel like I was in a much larger room. I love music that makes me feel like I'm in a really big listening space and this rig put Bruce Springsteen right in such a venue. The folded horn may not be as pretty as some other solutions, but with 107dB/W/m efficiency, this is a speaker for almost all amplifiers. The One Power Amplifier, a 50-watt Class A single-ended push-pull monoblock ($45,000/pr) certainly did the job on the big flared horn while the folded horn woofer was driven by an internal class AB amplifier. 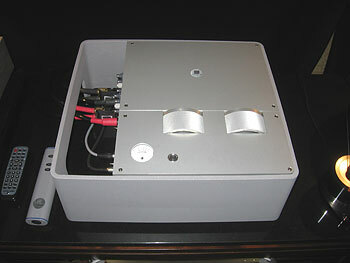 The small signal was fed from the battery powered One Pre-amplifier ($37,000), also from Avantgarde. The front ends were a Brinkman Lagrange turntable with 12.1 arm and Brinkman-EMT cartridge, ($24,475, total) and an Audio Aero Prestige CD/SACD player ($14,900). While the rig certainly needed a large room, it created an even larger one. The sound was mesmerizing and my only regret was that I didn't play the opening minutes of the fourth movement of Mahler's First Symphony. In case you are wondering, the crescent shaped controls on top of the preamplifier shown here select the source and control the volume. Very slick. Some felt that the high frequencies fell off if you moved out of the sweet spot, but as I walked around the room, my emotional connection with the music remained strong. 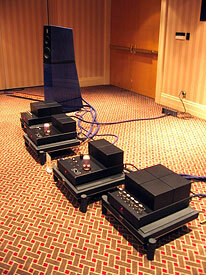 This was the finest audition of Avantgarde loudspeakers I have experienced. Before leaving I made one last attempt to meet with Albert Yeung in the Loyalty Sound Ltd. room tucked away on the far side on Level A. I wanted to ask him about the beautiful Melody H2A integrated amplifier ($3850) shown here. The design is Australian, but it is produced in China, I believe. Most intriguing is the spec that it produces 18 wpc using a pair of 2A3 tubes per channel in push-pull configuration. It is beautiful chassis in gloss black represents cutting edge design coming from China. Unfortunately, it was only on silent display. I wanted to rectify that. By the time I left the Sheraton the slush had become slippery. 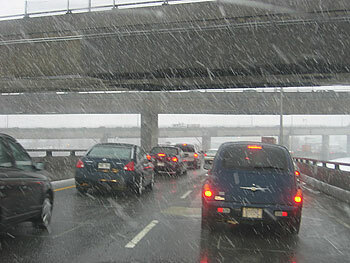 I retrieved my car without having to pay for overtime and made my way out toward the 401 in the Friday night rush hour traffic. In the next six days the NCAA Championships and the High Point furniture Market lay ahead of me, as well as a bicycle ride up and along the Blue Ridge Drive. Hopefully, the road goes on forever... and maybe passes through Denver. Click here for FSI Expo 2008 show report homepage.